An acquiree is a company, business, or corporation that makes for a viable candidate for a merger or acquisitionMergers Acquisitions M&A ProcessThis guide takes you through all the steps in the M&A process. Learn how mergers and acquisitions and deals are completed. In this guide, we'll outline the acquisition process from start to finish, the various types of acquirers (strategic vs. financial buys), the importance of synergies, and transaction costs. The acquirer is the company purchasing another company. The process of acquiring the target company can take on different flavors, and it will depend on the attitude of the acquiree’s management. Often, the owners and shareholders of the acquiree are in favor of the transaction, ensuring a smooth takeover process. However, it is not always the case. If the acquiree’s management is opposed to the transaction, they can employ different aggressive methods to stop the takeover. The acquiree is often purchased at a premium – a price that is higher than the fair market value. 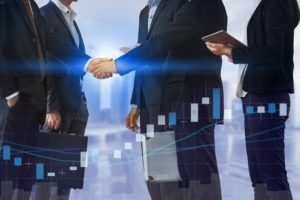 The practice is very common, especially if the acquirer perceives that the target company will bring more strategic value to the merger or acquisition. For example, if the acquirer expects greater economies of scaleEconomies of ScaleEconomies of Scale refer to the cost advantage experienced by a firm when it increases its level of output.The advantage arises due to the inverse relationship between per-unit fixed cost and the quantity produced. The greater the quantity of output produced, the lower the per-unit fixed cost. Types, examples, guide once it takes over the acquiree’s operations, it will be willing to pay top dollar so that the acquisition can go through. However, such benefits do not always materialize. There could be hidden costs, which the acquirer is not aware of, particularly when the acquiree turns out to demonstrate more social or cultural differences than anticipated. When it comes to acquisitions, friendly takeoverFriendly TakeoverIn M&A transactions, a friendly takeover is referred to as the acquisition of a target company by a bidder with the consent of the management and board of processes and smooth transactions are more common than hostile ones. However, it is the latter type of acquisitions that make headlines. So, what makes a particular company a good candidate for an acquisition or merger? One factor that makes a company attractive to acquirers is being strategically located. For example, if the acquirer can keep its production costs low by acquiring the other company, then the acquirer will be willing to pay a higher price for the acquiree. Thus, when there’s a smooth acquisition, the acquirer will look for ways to save money by minimizing redundant overheadsOverheadsOverheads are business costs that are related to the day-to-day running of the business. Unlike operating expenses, overheads cannot be traced to a specific. For example, there would be no need to continue keeping two warehouses when one is enough to get the job done. Another reason why a company may be attractive to acquirers is if it has a clean operating background. It means that the target company has consistent sources of revenue and steady operations. Keep in mind that most acquirers will want the acquisition to go through without any issues. As such, they will avoid companies that have filed for bankruptcy in the past or ones that have a history of losing major clients. How proactive has the acquiree been in narrating its story to the investment community? Does the target company show a trend of repurchasing its shares in the open market? Acquirers are not only interested in businesses that will thrive as part of the bigger corporation. They’re also interested in the ability of the acquiree to carry on operations as an independent entity. As such, suitors prefer companies that can improve their shareholder value. In some instances, when one company acquires another, the management team is replaced with a new one. However, in other situations, the management is retained, primarily because of their experience in running company activities. Therefore, many acquirers will be interested in whether the acquiree is well run. Good stewardship serves as proof that the target company’s assets are in good condition and that its client base is content. Nearly every company encounters a situation that calls for litigation, at some point in its life. However, most acquirers stay away from companies that have experienced or are experiencing a ton of lawsuits. This way, the acquirer minimizes the risk of investing in an unknown venture. As a company increases its sources of revenue, it enjoys economies of scale. It means that while its revenue and profits increase, its overhead costs are kept at a minimum or remain constant. Overhead expenses refer to items like rent, utility bills, and payments to suppliers and employees. An acquirer will be attracted to a firm that shows potential to improve its economies of scale. This investor will also prefer to purchase a company with a solid cost structure and a feasible plan for increasing its revenue. Another feature that makes an acquiree attractive to investors entails having a solid network of distribution. It particularly affects target companies that are in the manufacturing industry. The acquirer will want to know the amount of sales the company is making and how it markets its products. An acquiree that is able to create its product in a cost-effective way and then deliver the product to its customers in a timely fashion makes the best candidate for an acquisition. An acquiree is that company that is being bought through an acquisition. Acquisitions are a common practice in the corporate world. However, an acquiree should possess certain features to make it attractive for an acquisition. They include having a clean operating history, a solid distribution network, experienced management, just to mention a few. Toehold Position/PurchaseToehold Position/PurchaseA toehold position is an investment or acquisition strategy where an investor targets a particular company and buys less than 5% of the company’s stock.